This post is a bit of a moan on my part. I do apologise in advance. As winter approaches and I finished my scarf, I had the urge to try making some kind of headgear. As I’ve said before, I cannot crochet hats. I don’t know why. There is some disconnect between my brain and my hands which means the things I produce just don’t fit and/or look hideous. Some eternally optimistic part of me, however, seems to think that if I practise enough I can overcome this problem so I have spent the last couple of weeks hunting for a pattern to tempt me into trying again. 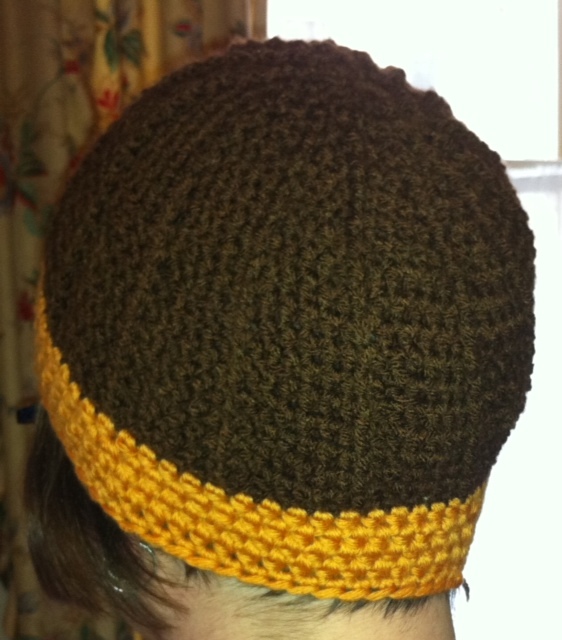 My first attempt was the Any Gauge Beret pattern in the most recent issue of Inside Crochet. The final result was an abomination which I frogged before anyone could see it. I am sure the pattern is fine and the problem lies with me but, honestly, it was a floppy, misshapen mess and a waste of good wool. 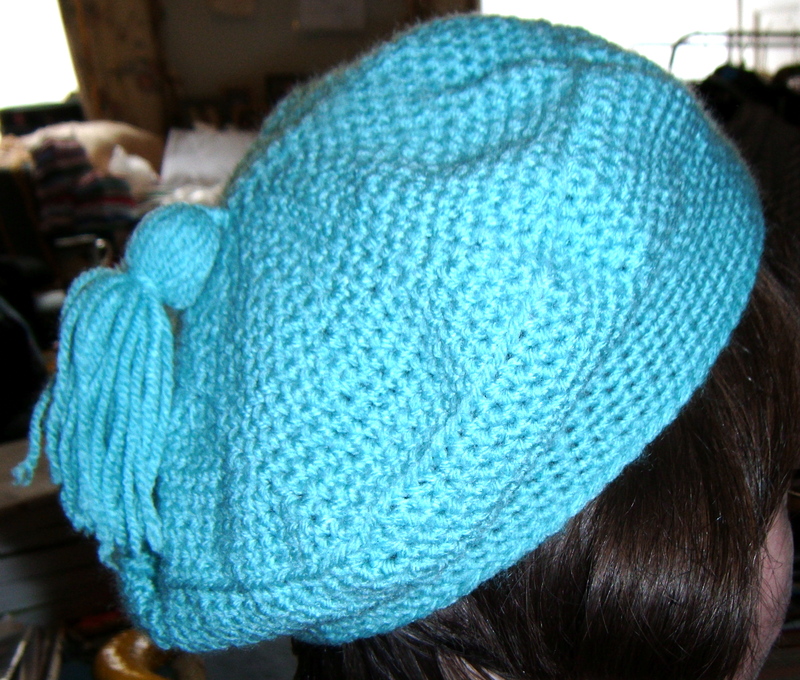 Then I spent sometime rummaging around on Ravelry and found the Durango Hat pattern. It was free, masses of people had managed to make it work and it looked quite sweet so I thought I would have a crack at that instead. I didn’t actually manage to stick to the pattern as published. I had to add a considerable number of rounds after row 7 to get a hat rather than a yarmulke. I was using the prescribed yarn weight and hook size but there was no way an 11 round version of this was going to cover my head. God only knows what it is I did to make this necessary. I do like the raised effect on the main body of the hat. The other modification I had to make was to use a double stand of wool for the brim. One strand worked but the whole effect was a bit too holey-looking for my tastes. Not sure why I am posting a "front view" too as you can slap it on your head at any angle. It feels necessary though. 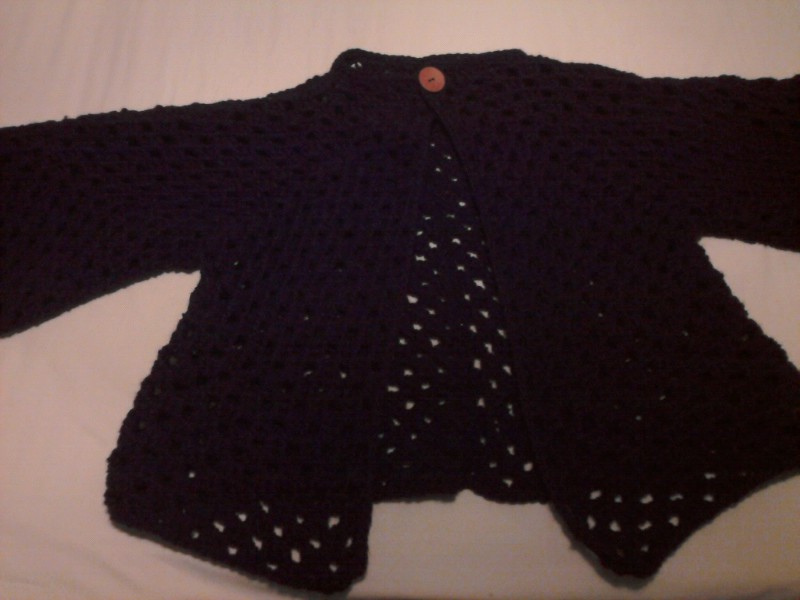 that you can make an adult sized jacket using the granny hexagon method but you probably won’t want to wear it when you are done. Be glad it is a dark photo. I am sparing you the full horror. 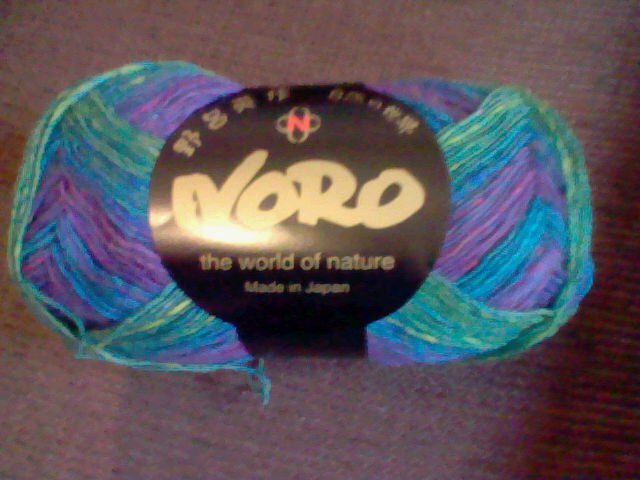 I have acquired some more yarn – like I actually needed any – but it has put me in a bit of a quandry. The shop where I attend a weekly “Knit and Knatter” evening was selling off some Artesano yarn as they were discontinuing the colours. 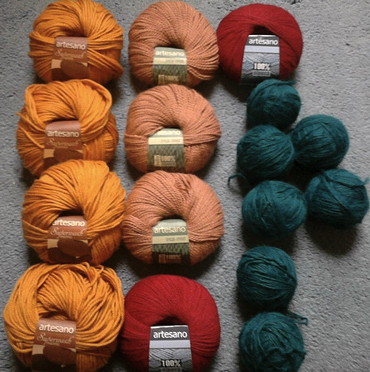 I got four balls of a mustard yellow in DK and three of a pale terracotta shade also in DK for a snip. Then, in the same week, I renewed a magazine subscription and was sent two balls of red 4 ply. I had also got around to frogging a misshapen shrug which leaves me 7 balls of the blue in DK Artesano Alpaca. The thing is, I have no idea what to do with them as there isn’t a vast amount of any colour. I keep getting them out and gloating over them as I do love a bargain and the colours are fab but, in terms of inspiration, I have got zip. I have discarded the idea of blankets (yawn), scarves (bigger yawn) and hats (always cause me problems.) Equally, I don’t want to buy any more than I already have on the grounds that my yarn stash seems to be taking over the flat. I think it may related to Audrey 2 and needs pruning badly. So this an appeal: Anyone want to suggest their favourite small project to get me started? All ideas gratefully received. I am rather proud of myself at the moment as I have finally made the effort to organise my stash. Hurrumble for me! The armchair in my living-room had become covered in balls of wool tied into plastic bags and I had frankly begun to lose track of what I owned. Having sorted it out (and been appalled by the sheer weight of yarn in the house), I resolved to find a better storage solution than a legion of carrier bags. 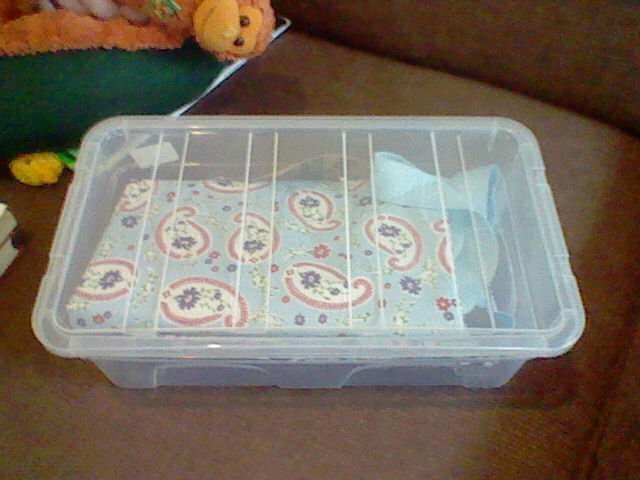 Today in Cargo I found a large zip-up bag to store the wool and a small plastic box to keep current projects on hand. It now all looks a lot neater than before. The shopping experience itself was a bit odd though. At the till, the cashier asked if I wanted a carrier bag. Trying to be virtuous, I said “No, just put one inside the other.” She took me at my word. Monkey thought this was hilarious. 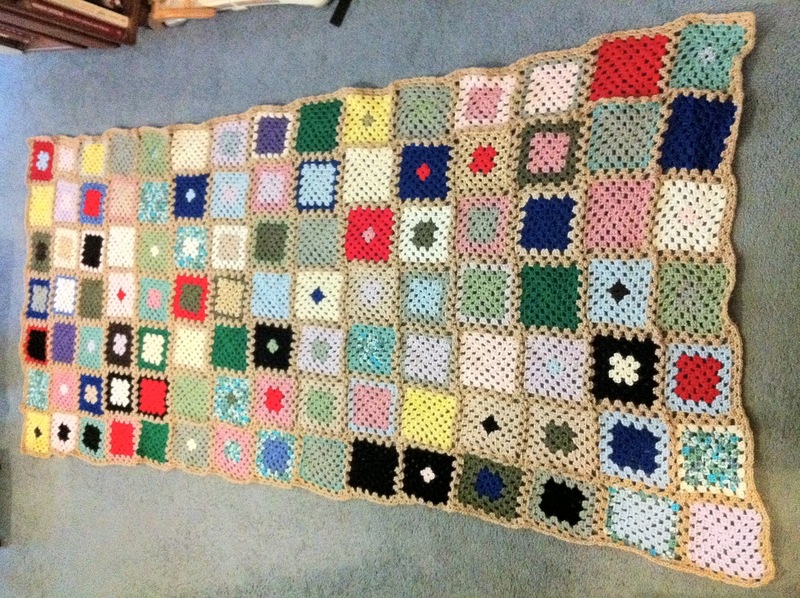 As well as being more organised, my stash had been greatly reduced by the giant granny square blanket I started at the same time I began this blog. I joined the squares while watching my way through the complete Steptoe and Son so I think it will forever be bound up in my mind with Oildrum Lane. It is a truly garish piece but very warm to snuggle under on the sofa. I am also still churning out toys for The Toy Society but the weather has been a bit too wet to actually make any drops recently. The Roly Polar Bear from my last post is still waiting to go out. My next toy was meant to be a smiling sun to hang in a window or over a baby’s cot. How hard could that be? A semi-circle with a smiling face and a nice wavey edge for the rays – piece of cake. 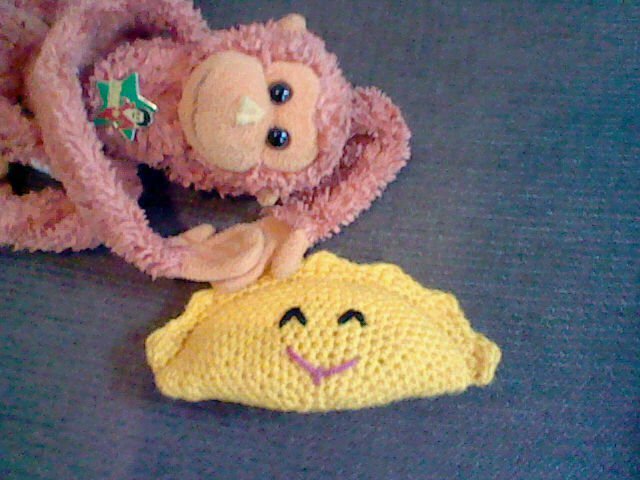 Somewhere between my brain and my hook, however, something went awry and what I actually ended up with is an insanely cheerful looking Cornish Pasty. Monkey is a big fan of the Happy Cornish Pasty. I am rather fond of him as he looks so mad but I keep craving pastry when I look at him so I think I will have to send him on his way and see how he gets on. All in all, I felt justified today in visiting the new wool shop that has opened near me and buying this rather lovely sock wool as a treat. I know lots of people who are trying their hand at knitting socks at the minute so I thought I would give crocheting a pair a go. I’m not totally convinced they will be a success but at least I know they will be a lovely colour. 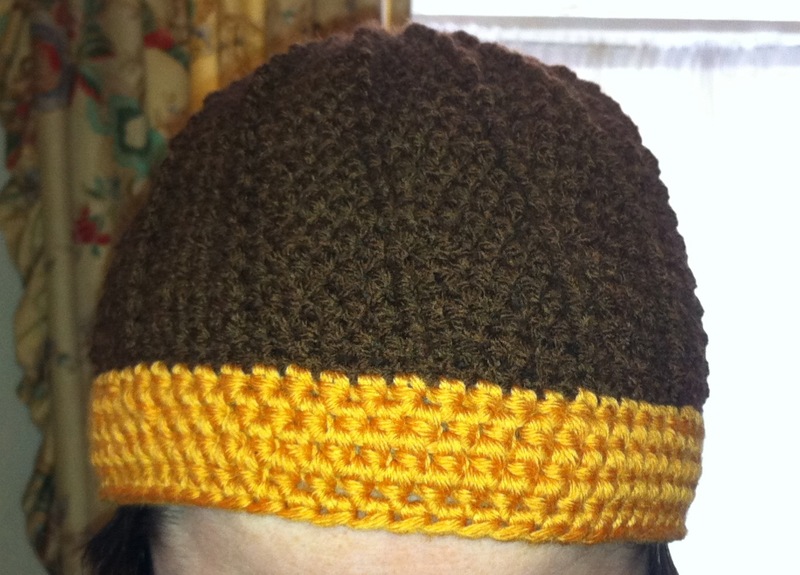 Despite having crocheted for a few years now, I have always had a problem with hats. I don’t know what I do wrong but, despite gauging a swatch, paying close attention to hook size, tension and yarn, my hats always seemed to be doomed to failure. They came out too big or too small or just a really strange shape no matter how hard I concentrated. *I would get so far in, realise that the whole thing had gone horribly wrong again, unravel like a maniac and sulk. ** I repeated this sequence from * to ** on a semi-regular basis whenever I ran into a pattern that I thought would look great on my head. This winter I decided that I had to break the cycle. Hats are recommended to newbies as a step up from scarves for heaven’s sake! I could follow any number of more complex patterns so I was determined that I had to crack the headwear problem. This determination, however, then coincided with a dearth of patterns that I actually liked. I has already made a shell scarf from a pattern in Inside Crochet so my choice of colour and wool was already set and that made finding the right hat even harder. Eventually my inspiration came from the brilliant Crafty Tardis – I lurk here a lot, enviously eyeing people’s Doctor Who creations. 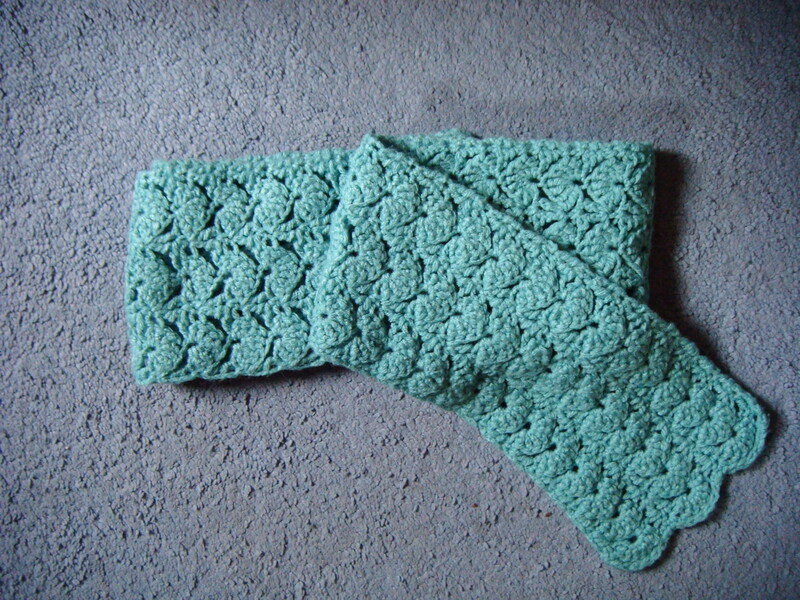 Someone had posted a plea for a pattern for the crocheted tam-o-shanter that Martha wore during Family of the Blood. She only wore it in a small number of scenes so you will have to excuse the screen-cap below but it gives you the general idea. In my head it’s a Martha Jones hat and it makes me very happy. In reality I think it’s akin to the philosopher’s axe. I might look back in a few years and shudder to think I ever wore it out in public but the joy of having created my own hat hasn’t worn off just yet. Now, if only I could learn to follow a pattern.